One of the leading brand and largest manufacturer of car in Pakistan, Suzuki is coming up with a launch of its new standard model of Celerio in Pakistan. 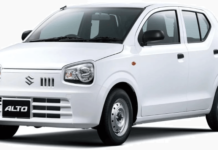 Pakistan Suzuki Motor Company limited has decided to bring a drastic change in Pakistan Automobile Industry by replacing Cultus with Celerio. Celerio is being called in International market however here in Pakistan this car will be named as Cultus. Pakistan Association of Automotive Parts and Accessories Manufacturers will be joining hands to make it successful as they announced for providing parts. It will be endeavour to achieve the quality with affordable prices as low as possible. Pak Suzuki replaced earlier its Khyber with Cultus in year 2000 that made remarkable success. And now Celerio will now take the place of Cultus in this year. Celerio has 1000cc engine with price 1.124 million for the petrol and 1.199 million cost for CNG as mentioned on their company site. The decision, however, is a complete denial of their own official announcement dispersed in October last year as they said no new model is going to be launched in next two years. But now again this news is circulating on social media.